On this page, I describe how I play around with exposure on the Panasonic TZ202 camera. I start with a general part that is more or less the same for each camera, and then the camera-specific information follows. Note: I do not cover Metering Modes here, that is methods of how exposure is determined. The Panasonic TZ202 offers three such modes: Multiple, which I use, Center-weighted, and Spot. My starting point is the "automatic" exposure value provided by any of these modes. Interestingly, it took years before I created pages dealing with exposure for my cameras, starting with the Panasonic TZ202. Does this mean that I never care for exposure and just trust what the automatic modes provide. Yes and no. Yes, because I typically use one of the automatic modes, mostly P mode, sometimes A mode, particularly for close-ups, to determine the exposure values for me. I rarely use the M mode, and if, mostly for astrophotography, where even exposure compensation may not be sufficient, because the objects are small and very bright (Moon, Jupiter, Saturn). But this does not mean that I always accept exposure as it is provided. For illustrating this, I would like to make a few remarks beforehand. When I used analog SLR cameras, I found out whether exposure was correct only when I received the film from the lab, that is, when it was too late. With digital cameras, however, I was now able to see in beforehand, at least as a simulation, how exposure would look like. And after the photo was taken, I was now able to see immediately how it turned out. Thus, in many cases, for example, for static objects, I had the opportunity to modify the exposure values and repeat the shot. When I bought my first digital SLR, or DSLR, I felt myself thrown back to analog times: The view in the viewfinder was purely "optical" and not a simulation of what to expect. After the photo was taken, I might have had a look at it on the rear LCD screen. But being used to digital cameras with a viewfinder, I never took a look at the result, because this was an extra step which I did not think of and which I felt was in the way of taking photos. In the end, contrary to many well-known photographers, I decided that DSLRs are not for me and switched to a kind of system camera with a digital viewfinder, the Ricoh GXR. And I will definitely never ever buy a DSLR again, particularly since EVFs are improving all the time. To sum up, my style of taking photos is judging the photo on the basis of the exposure simulation in the viewfinder and also, mostly only briefly, on the outcome that is displayed in the viewfinder or on the LCD screen afterwards (for a few seconds or longer...). Some people, however, turn this preview off because it disturbs them when taking further photos... I also have to add that cameras differ with respect to the exposure simulation, and I had some issues with this when I used the Leica X Vario. Now the question is: I see a simulation of how the image will be exposed in the viewfinder (or on the LCD screen) of my camera, and I am not content with it. What can I do as a JPG shooter? Here are three general suggestions that apply to most digital cameras! The most direct way would be to simply use M mode, and I read of people who just do this. The easiest way of doing so would be "manually simulating" A mode, that is, select an f-stop and then change the shutter speed until the simulation looks OK. Most cameras also tell you their "opinion" of this as well, that is, they indicate how much the image is over- or underexposed relative to what the camera's automatic exposure system would select. Of course, you can fiddle around with both aperture and shutter speed at the same time - and sometimes you have to do this because the shutter speeds are, for example too long and you have to readjust the aperture value. You can also fiddle around with ISO values for getting more suitable shutter speed values. (On some cameras, you can even use Auto ISO, and the camera automatically adjusts the ISO value in order to realize a correctly exposed image with your aperture and shutter speed settings, but this would not be what you want). So much about this approach that I typically do not use. Locking exposure means that you point the camera in a certain direction so that the simulated exposure looks OK to you, then lock exposure, reframe the picture, and take the photo. 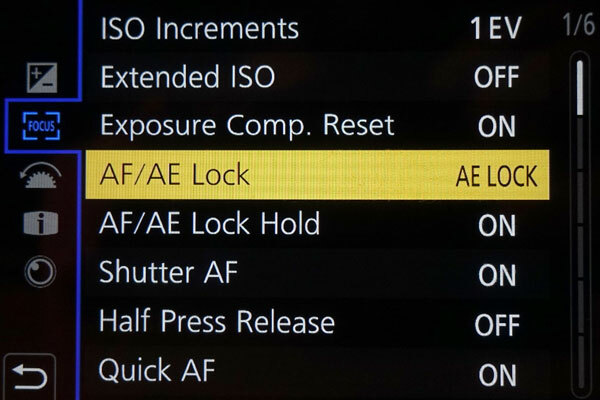 There are usually two approaches to this: half-pressing the shutter button and/or using a dedicated (AE Lock, AEL) button that you hold or press. In both cases, the button may also lock focus, which may be welcome or not. Since there are situations, in which I want to lock only one of them or both separately, I prefer a camera that, in one way or the other, allows me to lock exposure and focus separately. Locking exposure typically works by half-pressing the shutter button (the image is taken when you fully depress the shutter button). That is, you point the camera to a region that delivers the correct exposure, half-press the shutter button, reframe, and take the photo. This may be somewhat fiddly on some cameras, depending on the way the shutter button behaves, and in most cases it also locks focus. On some cameras, though, you may be able to set whether you want to lock exposure only, focus only, or both. 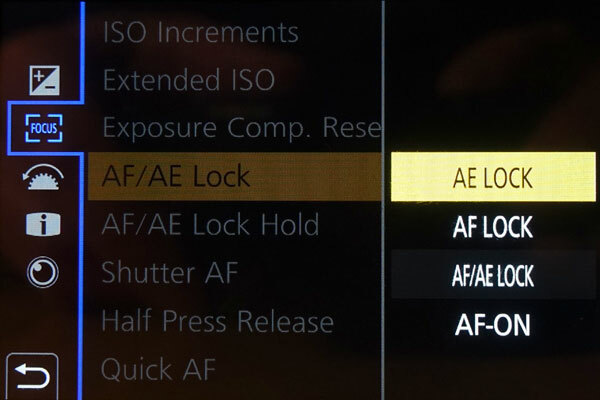 Some cameras have an explicit button for locking exposure (AEL), focus (AFL), or both (AFL/AEL, for example). This button many be dedicated to this functionality or configurable. The locking functionality may also be assigned to any function button, custom button, or whatever button on the camera. Anyway, pressing this button will, depending on what the camera offers and how you configured the button, either lock exposure, focus, or both. Typically, the button can be configured as a "hold" button that locks only as long as you press it, or as a "toggle" button (Panasonic calls this "hold" to make confusion complete...) that you briefly press and then release. I personally prefer the "toggle" version. For removing the lock, you have to either release the button ("hold"), press the button once more ("toggle"), or perform any other function. So the procedure is: You point the camera to a region that delivers the correct exposure, press and hold or just briefly press the AE Lock button, reframe, and take the photo. And in the case of a toggle" button, do not forget to press it again! Exposure compensation means that you can move the current exposure value (EV) for typically up to +/- 3 EVs (or f-stops), usually in 1/3 EV steps. Thus, you modify the exposure value as given by the camera until you are content with the exposure preview. This means that you typically do not move the camera but use the actual frame that you want to take a photo of. Some people use this functionality to "bias" the "base exposure" of their camera, because they feel that it generally under- or overexposes the images. Typically, they set exposure compensation to a value of -0.3 or -0.7 EV in order to avoid blown highlights. Pressing the shutter-release button halfway down. Note that this also locks focus (but not always, the behavior can be more complex - see below)! Pressing the AF/AE Lock button. 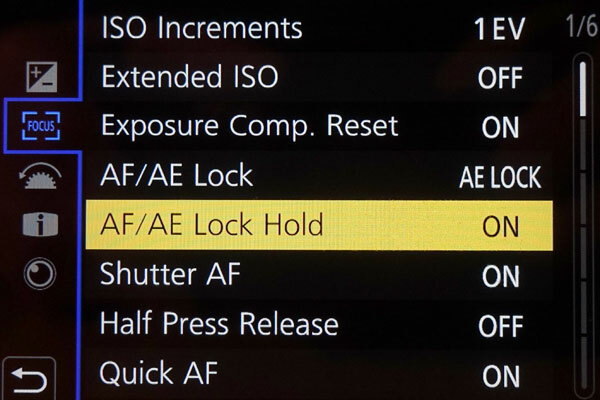 Depending on how you configure this button, you can either lock exposure, lock focus, or lock both by briefly pressing this button (configured as AF/AE Lock Hold = ON) or pressing and holding it (configured as AF/AE Lock Hold = OFF). Since locking exposure and/or focus is interwined, I dedicated an extra page to the topic of "locking": Locking Focus and Exposure. Please read this page for details! Exposure compensation means that you "bias" the exposure that the camera considers as correct according to your taste in the direction of over- or underexposure. 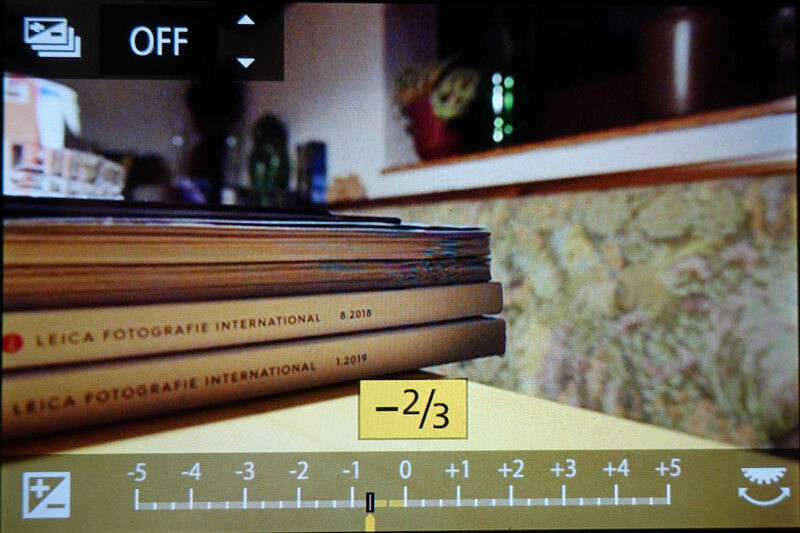 On the Panasonic TZ202, this can be done up to +/-5 EV (exposure values) and in 1/3 EV steps. 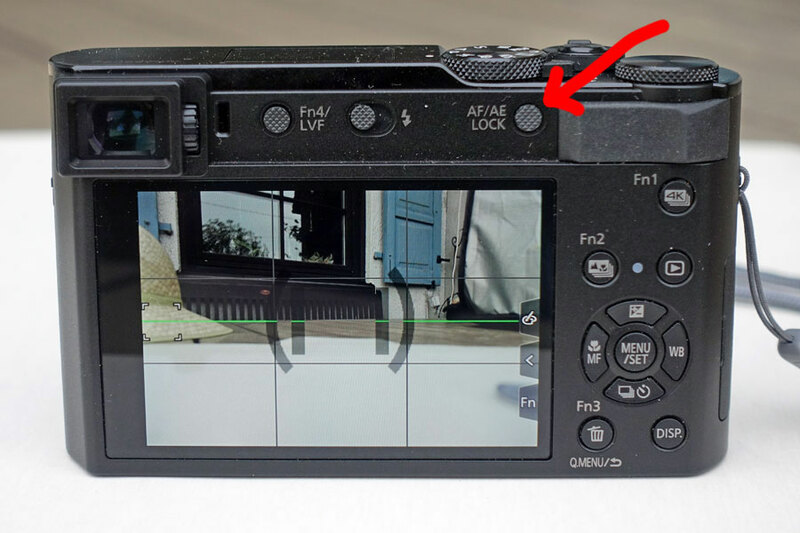 There is a dedicated button for calling this functionality on the camera back, the "up" cursor button. You can also assign this function to the control ring or rear dial and simply turn the ring or dial. This, however, typically conflicts with other functionality, even though it may be handy at first sight. Exposure compensation can also be assigned to a function button, but I cannot see the value of this, since there is already a "dedicated" button for this that cannot be reassigned. As already mentioned above, some owners use exposure compensation to permanently bias the exposure of their camera. In practice, I simply press the Exposure Compensation button and then rotate the rear dial or press the left and right cursor key to adjust the image in the viewfinder so that it suits my taste. As mentioned above, you need not move the camera and reframe the picture when using exposure compensation, which can be considered as an advantage. There are, however cases, where exposure compensation may not suffice, On such case are small bright objects like planets or the moon. In such a case, I switch to M mode, select a suitable aperture value, and adjust image brightness in the viewfinder to may taste by changing the shutter speed. Of course, you can fiddle around with both aperture and shutter speed more or less in parallel, and you can also change ISO to shift the values is a certain direction. It is all up to you. Moreover, the camera displays that you are off from what it regards as correct, and also how much if you are not too far off. For changing exposure to one's taste there are several options, such as locking exposure, compensating exposure or manual exposure. In the end, it is a matter of personal preference which one to choose and when. Frank Späth (2018). Lumix TZ202 - Das Buch zur Kamera. Point of Sale Verlag (ISBN-13: 978-3941761704).